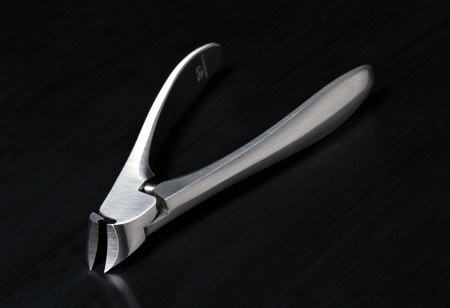 Most people don't give much thought to choosing a nail nipper as it is such a familiar appliance in their daily lives. Suwada's Nail Nipper "Classic" draws a line between other products by pursuing "the beauty of functionality" to the highest level as can be seen in the superior functionality, the shape with a high-quality finish, and the superbness of a handmade product. The sharp, curved blade, which fits the curve of the nail, is forged under high pressure and carefully hand polished. The tough sharpness of the blade is retained even after long years of use, and with the new "cylinder spring"-construction, where one side of the spring detaches from the lever, the tip of the blade will open wide, allowing the user to cut deformed toe nails. Furthermore, the tip of the blade is easy to see, so users who are not familiar with nippers can use them safely and comfortably. Therefore the basic principle of ease-of-use of an appliance is pursued to the highest level. "The attitude of manufacturing" held up by Suwada Blacksmith Works is condensed in the fact that the company cherishes craftsmanship while manufacturing industrial products, and thus sets as an example for local industries. "Tools that create beauty must also be beautiful themselves and must be something real that draws affection".